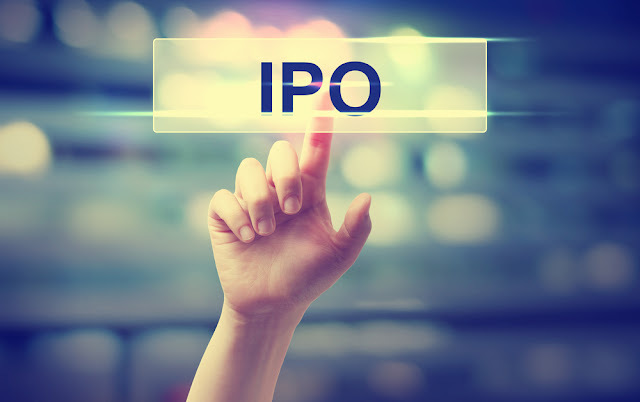 Indian Energy Exchange Ltd IPO....... Should you apply???? 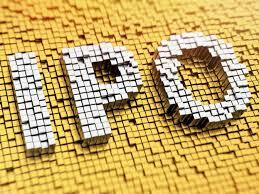 This is the second IPO of October and so far all the IPOs are having an awesome run at the markets. This actually reminds me of the situations in 2004 to 2007 when IPOs were riding on a power horse. However many IPOs that came out then lost huge market value and today are trading in pennys. As I see today those situations are surfacing. However let’s hope that the tides have changed and investors make good money in the IPOs to come. The IPO we are talking about today is Indian Energy Exchange Ltd(IEX). Lets first look at the basics. IEX Ltd are the largest exchange for the trading of a range of electricity products in India, in terms of traded contract volumes in the financial year 2017 according to the Central Electricity Regulatory Commission (the “CERC”). Basically the company provides a platform for energy trading. The issue is a pure offer for sale. No money will go to the company. The company was earlier promoted by Financial Technologies India Ltd. Due to the issues that surfaced in FTIL the company had to be divested and therefore there is no real promoter in the company. Apart from DCB no one holds more than 15% stake in the company. This means the company is professionally managed. Now let’s dive into the most important factor. The financials! 1. The company’s total Equity attributable to the shareholders has grown from Rs 171.58 Crs as on 31.03.2013 to Rs 305.62 Crs as on 30.06.2017. 3. 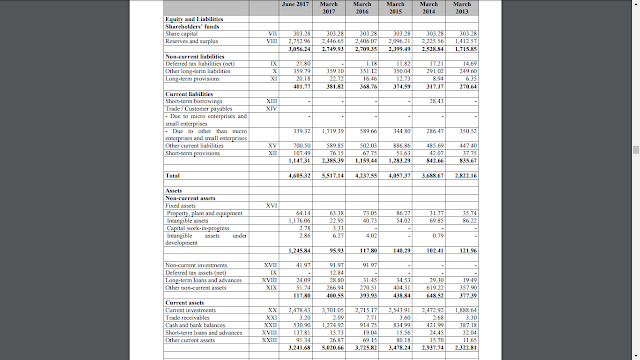 Something very important to note is that the company has acquired some intangible asset in Q1 of FY 2017-18 which has increased the total intangible asset from Rs 2.29 Crs as on 31.03.2017 to Rs 117.61 Crs 30.06.2017. 4. Further the company’s major applications of funds are in current investments, which stood at Rs 247.84 Crs as on 30.06.2017. 5. Company’s revenues have increased from Rs 138.36 Crs in 2012-13 to Rs 237.42 Crs in 2016-17. Even in Q1 of 2017-18 the company has made revenue of Rs 61.66 Crs which if annualized would be Rs 246.64 Crs. Quite good. 6. Profit of the company has also increased from Rs 66.30 Crs in FY 2012-13 to Rs 113.56 Crs in FY 2016-17. Q1 2017-18 has showed a profit of Rs 30.63 Crs which if annualized would be Rs 122.52 Crs. Very well for this company. The share is priced at Rs 1645 to Rs 1650. 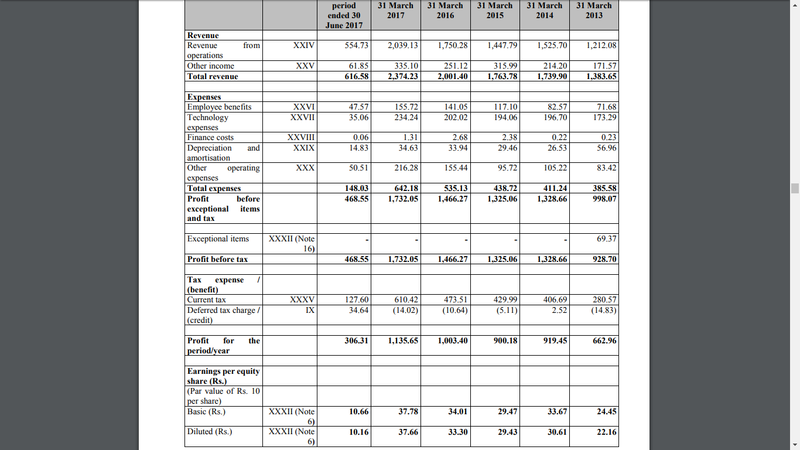 The EPS of the company is Rs 37.78 basic and 37.66 diluted. At this price the PE at basic EPS will be around 44. Although there are no other company to compare it with on the direct level, we can compare it with other exchanges like MCX and BSE. MCX is trading at a PE of 43 and BSE is trading at a PE of 40. Now this is wonderful pricing. Therefore I would say Indian Energy Exchange Ltd is a “subscribe”.